Today, I’m thrilled to have Brett Curry on the show. Brett is someone who I met through Drew Sanocki at the Traffic And Conversions Summit In San Diego and we hit it off right away. He runs OMG Commerce which is a 7 figure ecommerce agency that has helped over 125 companies with their pay per click advertising. Not only does Brett speak at major ecommerce events across the country but he also writes for a variety of sites like Digital Marketer and Search Engine Journal. He’s also the author of the ultimate guide to Google Shopping published by Shopify and the host of the ecommerce evolution podcast. 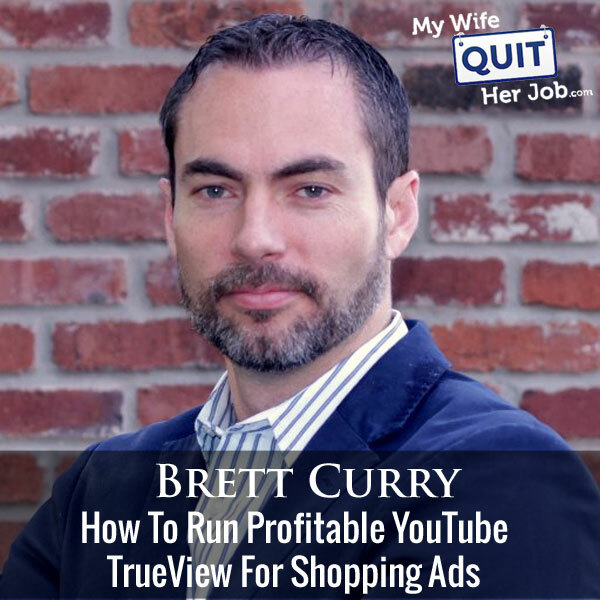 Now today I’m thrilled to have Brett Curry on the show, and we are going to talk about a cool ad platform that is very effective that very few merchants are using today. Brett has spoken at various conferences, and I know you’ll learn a lot. But before we begin I want to give a quick shout out to Klaviyo who is a sponsor of the show. Now I’m always excited to talk about Klaviyo because they are the email marketing platform that I personally use for my ecommerce store, and I actually depend on them for over 20% of my revenues. Now you’re probably wondering why Klaviyo and not a different provider. Well Klaviyo is the only email platform out there that is specifically built for ecommerce stores and here is why it’s so powerful. Klaviyo can track every single customer who has shopped in your store and exactly what they bought which allows you to do many things. So let’s say I want to send an email to everyone who purchased a red handkerchief in the last week, easy. Let’s say I want to set up a special auto-responder sequence to my customers depending on what they purchased, piece of cake, and there is full revenue tracking on every single email. Now Klaviyo is the most powerful email platform that I’ve ever used and you can try them for free at mywifequitherjob.com/K-L-A-V-I-Y-O. Once again that’s Klaviyo, mywifequitherjob.com/K-L-A-V-I-Y-O. Now I also wanted to give a shout out to my other sponsor, Seller Labs, and specifically I want to talk about their awesome new tool, Scope. Now if you know me I get really excited about tools that I like and use and Scope is a tool that actually increased my Amazon sales on several listings by 39% within the first week of use, crazy, right? Now what does this tool do that can possibly boost my sales so quickly? Well, quite simply Scope tells you what keywords are driving sales on Amazon. So here is what I did, I searched Amazon and found the bestselling product listings in my niche, then I used Scope to tell me exactly what keywords that bestselling listing was using to generate sales. I then added these keywords to my Amazon listing and my sales picked up immediately. So today I use Scope for all of my Amazon products to find high converting keywords in the backend as well as for my Amazon advertising campaigns. So I’m sure Scope can boost your Amazon sales almost immediately like they did for mine and 39% is nothing to sneeze at. So right now if you go to Sellerlabs.com/wife, you can check out Scope and save $50 off of any plan plus your first three keywords are free. Once again that’s Sellerlabs.com/wife. Now on to the show. Steve: Welcome to the My Wife Quit Her Job Podcast. Today I’m thrilled to have Brett Curry on the show. Now Brett is someone who I met through Drew Sanocki at the Traffic and Conversion Summit in San Diego and we hit it off right away. Now Brett runs OMG Commerce, which is a seven figure ecommerce agency that has helped over 125 companies with their pay per click advertising. Now not only does Brett speak at major conference events across the country, but he also writes for a variety of sites like Digital marketing and Search Engine Journal. He is also the author of the Ultimate Guide to Google Shopping published by Shopify, and the host of the Ecommerce Evolution Podcast. Now, today what I’m going to do is I’m going to pick Brett’s brain and talk about some of the PPC platforms that not a lot of the little guys are using yet such as shoppable TrueView ads. And with that, welcome to the show Brett. How are you doing today man? Brett: Hey Steve, I’m doing fantastic, really excited to be here. Thanks for having me on. Steve: Yeah, really happy to have you. Let’s start by having you give us a quick background on how you got into ecommerce and why did you decide to create an agency of all things? Brett: Yeah, so I kind of fell in love with marketing. I started working for a radio station in college. So I was kind of trying to pay my way through college, I was selling ads to business owners. I fell in love with marketing; I fell in love with ads, just kind of kind of a psychology behind it, what causes people to take action and buy things, and so changed my major to marketing surely after college. I don’t know if this was divine providence or just youthful ignorance, but I started an agency right out of college, probably not the best idea, and but just grew it and it started working mainly with companies doing traditional marketing, so TV, radio. TV was my passion and so helped that, and then I guess in 2004 I had a client coming to me and say, hey do you know SEO? They were an ecommerce company and I said no, I know nothing of it and he said, we will pay you to learn it. Steve: I’m sorry, what does that stand for? Steve: Oh, okay, I was thinking of it, oh my gosh! Brett: That’s what everybody thinks, but it’s one of those things where we kind of started the business as more of a project. We didn’t even put like time and energy into the name. So Online Marketing Giant is what came out. Brett: But then everybody started calling us OMG, so that’s what we stuck with. But yeah, started doing — tried everything in the beginning like a lot of agencies do and that was a mistake. We were doing development and design and all kind of stuff. And we realized, we are good at search, like we do search really well. And so that’s kind of where we’ve been focusing since about 2010. Steve: How has that evolved into like Google Shopping and some of the other search campaigns that you have done? Like it sounds like before you started out with SEO, right? Brett: Yeah, and we still offer SEO and I’m still a believer in SEO, but it’s changed so much. Like I think now one of the best things you can do with SEO is just to make sure your data is correct, and make sure your site is crawlable and structure it, and then make sure you are putting on great content as there are no shortcuts, no secrets, tricks to SEO any more in my opinion. So we still do a little bit of that, but the thing that forced us to do more on the page search site is Google start changing the SERPs, the search engine results pages. Ads are now dominating the top, you know often the top four spots, and you got Google Shopping which is very prominent. And so we started doing more and more paid because we love the math there, future campaigns down, then you spend more, you make more. Everything is measurable and trackable, and you have a lot more control which is great. And then I guess it was about, I was getting my — I’m bad with dates, but I think around 2012 is when Frugal which was the old Google Shopping right it used to be free. Brett: It transitioned, yeah so transitioned into product listing ads. I had a friend of mine who owns an ecommerce store who pulled me aside one day and he is like, dude, I’m getting ten to 12X on my product listing ads. I was like whoa, so I kind of dug in then with both feet because we had some ecommerce clients, and I just felt like man, this is going to be huge. And so we really tried to establish ourselves as experts there. Brett: And so yeah, so it’s worked well, so I get to speak at Traffic and Conversion which is where I met you and speak at RCE in June on Google Shopping. So it’s phenomenal but then it also relates to what our topic is today of shoppable TrueView which is pretty cool. Steve: Yeah, so before we actually get into that I’m just curious and I want the listeners to hear this because I always get questions on how to rank organically in search. And I just wanted quickly your take on you know, if you are just starting out going after organic versus PPC traffic, and I know my answer to this question, I’m just curious what yours is. Brett: Yeah, I would definitely go — I would focus more, well, I would do both, but I would, I would put more emphasis on the paid search in the beginning because you can control it. And also if you’ve got a site that has no traffic, so nobody is visiting the site, nobody is clicking around or anything, Google is going to be pretty hesitant to rank that. That’s what we’ve seen anyway. Not the traffic itself is a huge signal but zero traffic can cause some hesitation, recently what we’ve seen. So I would definitely work on getting your structure correct, your title tags and good content, but I would put a little more emphasis on paid searches, did you ever thought that Steve? Steve: Yeah, my answer I always give is SEO is always kind of a slog, like you might not even see results until like a year, a year and half later. Steve: And so you need to get some traffic there. And then Google actually needs that traffic to determine whether your content is actually any good because they have a lot of measures for like time on page and user metrics and that sort of thing so. Brett: Exactly, and I think that’s fantastic right, like I know a lot of SEOs complain about that. But I think Google looking at those on site metrics and using that to influence the ranking out rhythm makes sense, like they want to rank sites that people consume, and that they are actually good. So the other thing I think you can do is you can start to use some of your copy, your headlines and some of your hard copy that work to potentially influence your meta description, which is mainly — it’s not a ranking signal, it mainly just helps to get the clicks, so you can use that. You can maybe use some of your headlines and ads that work to influence your title tags which I think can work. And then and one thing that’s weird is about the hierarchy of your ecommerce sites. So home page is most important, then category pages, and then product detail pages. And if you can spend time on these categories pages, try to build the authority, try to share them, try to make sure they are structured right, that can kind of pass through the authority to the other pages. Usually for new sites though it’s those product details pages that will rank first because they will rank for long tail product specific queries. So yeah, fully grip. SEO it is a marathon for sure, months and months usually in the works. Steve: Okay, it’s good have that it’s coming from someone who does this for a living. I’m just curious also before we begin like how do you kind of differentiate you agency from like the thousands of other PPC agencies out there? Brett: I know, I know it’s tough. There is a lot us, that’s for sure. I think it comes down to a couple of things. One, we think — we try to think more like business owners than just technicians when it comes to AdWords. So of course we are geeks when it comes to the numbers and we have formulas we use for Google Shopping and AdWords, and then so we all about the performance. We try to think strategically and try to think like business owners because my business partner and I, we are all business owners. We try to instill that in our people as well. We’ve had the good fortune of becoming a Google premiere partner, so in the top 3% of Google partners. I just found out a few weeks ago we are one of the fastest growing in season North America from Google’s numbers which is cool, but we will try and emphasis results and reporting, right? Brett: So we want to be keyed in on what your goals are, but then how do we show you what we are doing? And that’s really I don’t know if you’ve talked to many other agencies, but the act of reporting, like getting the showing clients what you’ve done and how it works and all that, it’s just tricky. We have a lot of clients come to us saying, I don’t know that my previous agency was terrible, but I never got any reports, I never knew what was going on, so reporting is huge as well. Steve: Okay, so Brett one of the reasons why I want to have you on the podcast is because you work with a variety of ecommerce companies, and you have a lot of data and experience with a bunch of different types of products, right? Specifically I want to talk about shoppable TrueView because it’s actually one of the few ad platforms that I’ve actually not tried myself. And so let’s start out for the benefit of the listeners, first of all what is it and how does it work? Brett: Sure, so let’s talk about TrueView first, just in case anybody doesn’t know what TrueView ads are. You’ve all experienced some, so if you go to YouTube, watching your favorite cat video or whatever. And before your video starts you see the ad that pops up and about five seconds in you see the skip ad button pop up. And what’s always amazing to me is and I’ve had this happen before where the ad will pop up and I’ll get angry, I’ll be like no, I want to watch the barbecue video or whatever it is that I’m looking at. But then something in the video hooks me, and I end up watching the whole thing. It seems to be like the Red Bull videos for me, for whatever reason they are mesmerizing. Brett: Yeah people jumping out of spaceships and back flips on motorcycles and stuff. But anyway I’m planning on skipping but then I don’t skip, and that’s kind of the idea there is you want to hook the person so they do watch all the way through. But the beauty of TrueView ad is if someone hits the skip ad button, the advertiser does not pay for that. So it’s called the TrueView, you have to watch at least 30 seconds of the video or the whole video, whichever comes first. So if it’s less than 30 seconds, yeah, watch the whole thing or the advertiser is not charged. If it’s longer than 30 seconds then the viewer has to watch at least 30 seconds before the advertiser is charged. And one of the things I mentioned briefly that I did some work in TV and radio. TV was always my favorite. I love the video component. I never created, I mean videos, but I worked on the campaign side of things structuring buys and where the video would run and things like that. But there is just something kind of magical about video I think. There is like almost a celebrity status if someone sees you or your product on a video especially if it’s on TV. But I think you get some of that with YouTube as well. Like seeing that video ad, just it can bring credibility, it’s just pretty powerful. But with TV, we were doing TV all the time with my small agency back in the early 2000s. Steve: Let me ask you about YouTube Videos in general. Steve: So I noticed some of them force you to watch like the full 30 seconds and some of them are the TrueView ads. So do you recommend using the TrueView type of ads? Brett: I do recommend TrueView. So the ones where you have to watch all 15 seconds or whatever, now they got some six seconds and eight second ads. We are actually experimenting with some of those six second and eight second bumpers is what they are called for a shoe client of ours, online retail that sells shoes. But it’s kind of a different purpose there, and usually you will see larger advertisers will do that just because all they care about is the branding. Brett: But if you are looking for someone to take action which we usually are looking for someone to click through, to visit the site, to click on the product listing ad, whatever the case may be, then we want a little more time and we also want people to self-select. So if they are not interested at all, then we don’t want to pay for that person. Brett: So yeah, usually it’s the TrueView that we are recommending. Steve: I’m just kind of curious what some of the metrics that you see are, because I actually, like when I’m on YouTube, I want to watch the video, right? It’s very rare and I don’t think I have ever actually clicked on an ad to actually get taken off the site to go somewhere else. I’m just curious what are some of like the click through rates that are good for like a YouTube ad? Brett: Yeah, so that’s kind of very pretty, pretty wild layer. There is a couple of metrics that we’d want to look at. One is the view through rate, right? So that’s kind of the first metric we want to look, and that’s the percentage of people that see the video, that actually complete a view. So again that will be the 30 seconds or whole video, whichever is first. So with that I mean ultimately it doesn’t matter I guess if you are making money on the back end what your view through rate is. But we see anywhere from on the really low end like nine to 12% on up to 20 to 30% if the video is compelling and if it’s highly targeted. Google will also show you your cost per click as well. So they don’t charge you for the click just to be clear there. So let’s say you are running an ad for your product and you get some kind of offer that overlays on the video, someone clicks on that to go to your site, basically you are charged your view rate. Brett: But what Google does is they’ll calculate a true cost per click, so they will look at all of your expense divided by clicks and give you a true CPC but that’s often a few dollars. Like if you are just looking at the CPC, you’d say, oh this is terrible compared to AdWords to look at click through rate. So the other metric we want to look at is view through rate as well which lets someone — I’m sorry, view through conversions so that someone who views the ad does not click on anything but then they purchase within a certain window. Brett: And to me that’s valuable because like you said, okay if I’m on YouTube it’s because I want to watch the sports highlight, or I want to watch this how to video, how to fix my mower, my dishwasher, whatever. But seeing that message, seeing that offer maybe I’m going to come back later to the site. So looking at the view through conversion rate as well is also important. Steve: And so Google can tell like if you switch devices and still consider that a conversion? Brett: There are — I mean Google is getting better and better at cross device conversions which we had our reps come in right from Mountain View a couple of weeks ago, and we were talking about that specifically. They are getting better at that, I mean it is not perfect in that Google kind of needs someone to be signed in on their desktops and on their mobile device to be able to be really connected, but Google is getting better and better at that. So yes, so someone can see, Google can see if maybe I convert on the desktop so I view the TrueView ad, I don’t click on anything, but then later I visit the site and Google can track that that person actually did convert later. Steve: Okay, and so you mentioned like a good ad that you’ve seen can get like a 20 to 30% view through rate? Steve: Wow, okay that’s really high, okay. Brett: It’s really high. Now I’m looking at some of the — I’ve got one campaign up now so the skin care products. It’s actually Boom by Cindy Joseph just a good friend of mine. We partnered on some deals, but this is one of his videos. It’s actually done very well; its view through rate is more like 11.78%. So again like you can’t take your view rate to the bank. Brett: You take conversations and sales to the bank of course, but it can at least indicate, okay how engaging is this video, and then we want to dig in a little further and see, okay when are people bailing, at what percentage? It could be that they are bailing when they see our offer pop up, and if so, great. Like we want them to take the click through and take the offer, but we do want to pay attention to that. This particular video that I’m looking at now that had the 11% view through rate, it’s a long form video, it’s like a four minute video. Brett: But their view through rate is based on the 30 second minimum though, so yeah, it’s going to vary. Steve: Okay, and in terms of targeting then, is this more like top of funnel stuff or is it more like retargeting? Like what do you recommend? Like if I was just starting out with my store for example and trying the YouTube ads, what would you recommend? Brett: Yeah, it’s good question. So yeah, for Bumblebee Linens as an example or any site, the first thing I would is start with remarketing list. Brett: And that’s where this has the most predictable wins. You know I think probably most people that are listening are learning some form of remarketing, I would anticipate that they are. And yes it’s pretty easy in AdWords to set up your dynamic remarketing where the products someone looked at, that’s a product that’s going to be in the ad provided that you get your feed set up and everything. But I would look at — for shoppable TrueView I would look at a couple of different remarketing lists first, and I’ll kind of break these down from least likely to convert to most likely to convert. So you can start with just all site visitors, and typically the more recent that visitor was the more likely they are to convert. So you may have all site visitors from 180 days, 90 days, 30 days, and then the most recent are going to convert the best. Usually we break up those audiences into different ad groups at least to manage different campaigns. Brett: But all side visitors, so obviously that anybody who has visited the site that they didn’t convert, let’s consider remarketing to them kind along the next step up they will be more likely to convert, would be product page visitors. That’s where you are saying, okay target people that visited a product detail page or PP viewer and maybe will bid a little more on that view. And then one step up of that would be then cart visitors, so people that have visited cart but abandoned. And again I would at the recency of 30 days, 15 days, seven day. Usually the 15 day or 14 day, seven day is what’s best, and then the step up from that and this one is kind of interesting. This takes a little custom work with your audiences, but the bought X but not Y list is a very powerful one. Brett: So back to Boom by Cindy Joseph, and Ezra actually had a case study that will be released maybe here in I don’t know, a month or two, but one of their more popular products is BoomSilk. So it’s a moisturizer, a skin care product for females over the age of 45, is kind of his target demo. But basically we get this list of all these buyers who have purchased from Boom but did not buy Silk. And so the beauty of that is then we can run a video targeting them that features BoomSilk, and then with that video then we have the product listing ad that runs next to it. So that’s kind of the beauty of shoppable TrueView. I guess I didn’t really explain what shoppable TrueView is, but that’s where you get your TrueView ad that’s based on a- you are only if someone views or clicks through to your site, but then right next to that, either under it on a mobile device or next to it or top of it on a desktop, you get your product listing ads. So picture priced title, those ads are right there by your video. So it really encourages shopping, pulls someone through to click on your products. So that bought X but not Y, I mean that’s a killer list right there that works very well. Steve: Just curious and maybe we can just use as an example since you are already doing a case study on it. So what do the conversions — what do the ROIs look like kind of going up that tree of audiences that you specified? Brett: Yeah, so we are having the most luck with cart visitors and then the bought X but not Y. The bought X but not Y that’s smaller list, so total conversions are a little bit less. I don’t have the actual numbers of that one — yes I mean we are looking at their cost per conversion goals. These are right under it. So we are kind of maintaining or coming a little bit under the cost per conversion goals for that particular list. Now actually for this one, for Boom, the cart visitors has actually worked a little bit better. It’s well below; it’s almost like a third of their CPA goal. Brett: They were getting on cost per conversions for that audience. A little bit different video, the one is just targeted just for Silk is that for specific product video, so it can be part of it. But yeah, I mean typically if you are looking at, hey what is my CPA? If you are doing, if you are running this as a remarketing vehicle and you got your lists set up properly, you got your products and your products listing ads are running next to the video, you can usually hit that CPA target or come in a little bit below it. We got a jewelry client, so they sell earrings, body jewelry, things like that. We are coming in at about 30% under their CPA target with this platform, and then getting some nice volume as well. Steve: I know for me I haven’t tried these YouTube ads yet but just my regular retargeting on Google, like the all website visitors tends not to return my investments that well. So I switched over to just cart ads and then all of a sudden it’s — and I’m just curious whereas you know on Facebook I’ll do visitors and it works pretty well or product views I should say, and it works significantly better than Google. Would you expect like the display ads to perform similarly to the YouTube ads with the retargeting? Brett: Yeah, I would think so, I mean I don’t know that I have ever done a comparison of the two to see how comparable they are. But we definitely see the same thing, so with all of our clients we recommend remarketing and typically dynamic remarketing because we are already running Google shopping; we got the feed there so we can do the dynamic remarketing. It is a little hit or miss when it comes to the all visitors. You are absolutely right, sometimes for certain clients that does really well, for others not that as much. But yeah, the cart visitor or even per detail page viewer is much more likely to convert, that’s for sure. Steve: I guess what I’m asking is should I be using these YouTube ads, the shoppable TrueView like if I’m successful with shopping and my display ads, like is this shoppable TrueView like the next step for me? Like should everyone be doing this basically? Brett: You know it’s kind of hard to say that everybody should be doing it, and I’m all just a little bit skeptical I guess as far as that goes. But I mean one, you do with that video assets and your product has to lend itself well to video. I think most physical products do, but there may be some exceptions. So if your product, you know probably demonstration, testimonial, having a good video that really shows the feature benefits of the product, it’s got a good call to action, you got your viewer rated products right there next to it, it can work very well. Steve: Yeah, can we talk about that for a little bit, like what makes great video content? Like you have five seconds to get them to watch, right? Brett: Exactly, exactly, so yeah, that’s one of the first steps is you got to hook them in the first five seconds because that’s all you have. So we had a — we got a client that sells barbeque grills and pellet grills and camping stoves and things like that. And so they brought us this one video they wanted us to advertise, we do a lot of video work for them. But they brought us this one video and it was like six seconds of the logo flying in and doing stuff and we were like guys, this is not going to work. Steve: Oh yes, yes, yeah. Brett: Yeah, it’s a great video, so there is this young attractive British girl in a toilet in a dress, yes so it’s very appropriate. She is on a toilet in a dress and something to the effect of- hopefully this is too inappropriate, but she says you will not believe the mother load I just dropped, right. So that’s the opening of the video and you are like what is this you know. So obviously that’s the humor play, and that can work for some businesses, obviously it wouldn’t work for others, but it at least hooks you in the first five seconds and makes you think. So back to the barbeque grill place like we said, hey, show the food, like show the food sizzling. I want to see a rack of ribs on a grill or some music behind it, the steam coming up, something like that. So hook them in the first five seconds, right? You also want to lead with the strongest benefits. So what am I getting from this? What is this ultimately doing for me? Is it a time saver? Is it money saver? Is it changing my life in some way? Is it allowing me to cook the best barbeque I have ever cooked? Is it allowing my bathroom in office to no longer sting? Whatever it is, lead with that, the strongest benefit. I think one of the things that people don’t do with videos, they don’t use it to its full strengths right so show me, don’t just tell me. Don’t give like just the bullet list, just flash like a bullet point up on the screen. Like show the product in action, show the video working and cutting through this really thick underbrush or whatever. Like show the product in action [overlapping conversation] [00:31:55]. Steve: Can you talk about production quality? Because I know probably a lot of listeners don’t have like the budget to create like a professional video, is that required or? Brett: Not at all, I’m really glad you asked that. Yes, I’ve mentioned some kind of well known ones that are high production quality, but no I do not believe it has to be high production quality at all. Shooting even with an iPhone, but as long as it’s to the point. I think it should look clean and it shouldn’t look sloppy, but it doesn’t have to have like a high finish quality right. If it was making via testimonial based thing, right? So it could be even a customer saying, hey, use this skin care product, I absolutely love it, he’s been using it for 30 days, these are the results that I saw or whatever. So it could be even more like a customer testimonial type approach. So there is not one right or wrong way to do it. I wouldn’t say, hey, let’s invest $5,000 worth of video production company to test this, like that’s kind of silly. I would look at how can we — the minimum viable product type approach. How can we get a video that speaks to our customers, that highlights the product, that has a good call to action, and how can we do that really affordably? Steve: Okay, so let’s assume that I have my shopping list or the feed, my product feed set up and let’s say I have a creative set up and I’ve run some ads into my retargeting list, so what do I do? Like what am I looking for in terms of metrics? So you mentioned the number, the percentage of people that actually view the video to completion, what are some good percentages? Like how do I know it’s a dud, and what are some of the next steps after I’ve let the video run for a little bit? Brett: Yes, so I would look at the view through rate in a couple of different ways. If it’s really low, like if its sub 10% then you may either want to think about two things; either the video is pretty bad. You know it’s not capturing someone, it’s not picking their interest, there is no benefit whatsoever. So it’s not causing them to want to watch. Or something is wrong with the targeting right, which probably shouldn’t happen if you are doing a remarketing list. Like that should be a pretty good list. But maybe, consider this has happened where someone thinks that their marketing to a remarketing list but they just have that in addition to a general audience or something. So if it’s sub 10% I would look at those two things; like either we are not targeting the right person or this video is really bad. So that’s something to look at for sure. The thing that we always do, this is not like your bread and butter campaign, right? If I were to say okay, your foundational campaigns that you are going to build your business on are your text campaigns and your shopping campaigns. Like those are your bread and butter, those are your real money makers. This is something you run in addition, like this is something that you help get more total conversions, because they didn’t convert initially and it’s your remarketing vehicle. We can talk maybe a little bit about top of funnel stuff in a minute if you want to. Brett: But this is not going to be your bread and butter, how I make millions of dollars you know with this campaign, but it can be very powerful. So then I want to look at your conversion rates, so how many direct conversions and the default there is those are conversions where someone clicks through the video and buys right then, right? Because the default is always last click attribution. So someone clicks through the video, they buy right way. So I would look at that, but then I would also combine your view through conversions and then calculate your total CPA, or total return on ad spend whichever metric you prefer to see okay, is this within my goal? So for remarketing campaigns I’ve got a $15 CPA, that’s my goal. Well, if I combine those view through conversions and the last click conversions, am I getting there or not? So ultimately for me that’s the biggest number is looking at my total conversions and view through conversions, and am I meeting my target, but you can also look at it at a couple of different ways. We have a few — they are not large clients like fortune 500 or anything but people with pretty good size budgets. They also view this as I just want to make sure people remember my name you know. Brett: And so then we’ll look at audience building as well. So one of the beauties of running anything on YouTube is you can build YouTube remarketing list. So as you run these videos, as people engage with them, they get dropped into a YouTube remarketing list. So that’s a list you can use in other purposes as well which that’s kind of cool. So you can say okay, people who have seen this video now I want to remarket to them with this other video. Brett: And almost create like a funnel with your YouTube targeting. There are also there a few YouTube lists. You can even remarket with your text ads, or you use like a remarketing list for search ads. Brett: Yeah so that’s growing and it’s only — I don’t even remember which list it is. It is limited so not all your YouTube lists can you use to target on search, but I do anticipate that will expand over time. Google is doing a pretty good job about making, allowing more and more audience layering, audience targeting even on the search platform. So that’s another thought, like the outdoor cooking company we work with. A lot of what want to do is like they just want; they want people to know their grill, right. And then they want those people to come to the site, so it’s kind of an audience component with a few of our advertisers, but ultimately I’m looking at CPA. Steve: Here is a random question, like let’s say someone watches one of these YouTube ads and clicks on it, but later on clicks on one of my AdWords and makes the purchase. Does Google double count that as a conversion? Brett: So right, so they would count that if it was in the view through window, then yeah, it would be conted as a view through conversion for that YouTube video, right? But the last click conversion, assuming you got a last click as your attribution which most people do, that’s the default, then it would also be attributed to that text campaign as well. Steve: Okay, so that makes ROI calculation confusing, doesn’t it? Brett: It can, it really can. Yeah, I mean one of my favorite quotes when it comes to analytics is by a guy named Avinash Kaushik. Have you ever read any of his stuff yet? Steve: Aha, I know who he is, yeah. Brett: Yeah former Googgler and Occam’s Razor is his blog, all that analytics, supper smart guy, but he says your goal with analytics and attributions is be less wrong. So you are never going to be right, you are never going to be 100%, so just continually try to be less wrong. We are experimenting with different attribution models now, so there is last click is what almost everybody uses so that’s the default. That’s where, say someone clicks on a YouTube ad and then they click on one of your text ads and then they come back through an organic search, with last click all the credit is going to go to that organic click, because that was the last click before conversion. We are looking at you know linear, we know some of these linear, there is time decay where you can maybe get a little more credit to the first click, a little more credit to the last click and a tiny bit of credit to those in between. We are also playing around with the data drone which is kind of interesting is where Google begins to look at all the attribution models, and they begin to assign different weights based on the numbers to first click, last click, middle click. But anyway yeah, that long winded answer, but yes it does make it tricky. Brett: So one of the things we recommend people do is let’s consider what that view through conversion actually means right. So and let’s make sure that we are building an audience and that we have other goals in place as well. So if you are looking at your click through conversions and you are just like barely meeting your CPA targets, then maybe you need to do some adjusting because likely it’s possible that that view through conversation is being attributed to something else as well. Steve: How do I come up with a good CPA target? Brett: Yeah, so I keep saying CPA because a few of the examples that I’ve used here that those clients prefer CPA. To me it’s either going to be — it kind of comes back to are you building a customer or are you are making a sale, right. So if you are making a sale and that’s all that matters, then is that am I profitable on that first sale. So I’m looking at AOV and my margin, and then I’m calculating okay, what percentage of my margin can I give up as a cost of advertising. Brett: Other people and Boom would be this way and we’ve got a few other where they look at, okay, we know people are going to purchase maybe a couple of times for the first year, so our CPA target is going to be based on that. Brett: But we actually use, we use return on ad spend a little bit more. And so that’s where — but it’s basics you get to either number it kind of the same way, but we try on ad spend as revenue divided by cost. Steve: Right, right, that’s what I use too. I actually tend not to use CPA but yeah. Brett: Because then, because a lot of our — we have some merchants that are like Boom where AOV is very consistent, so CPA makes sense. But we got clients that have over 100,000 products, so did someone buy the $10 product or did they buy the $1,500 product that makes a difference. So that’s why we usually favor return on ad spend. So that’s where again you are looking at okay, here is our margins so quick math, you have 25% as our margins. If you want to break even on that first order, we need a four X return — for return on ad spend. So you kind of get into the numbers either way, but yeah preferable 80% of our clients will look on return on ad spend, but CPA works as well. Steve: Can we talk about top of the funnel a little bit; I mean it sounds like you would use up a lot of money on top of funnel. Brett: Yeah, yeah. So this is something I just want to be totally transparent, we are experimenting a lot with this, so we got a couple of clients where they know, we know, hey this is experimental so we are not going to use a big budget, we are just going to start testing some things. So if you are just starting out, if the majority of businesses on Amazon let’s say you are just building your store, don’t go top of the funnel with video. They’re like — it’s kind of like getting a half-court shot at the buzzer, you know when it happens it’s awesome and not supper likely. Go for the lay-up, go for the remarketing list first. Brett: But what — so what we are doing though, I’ll just give you a little bit insight here. We are looking at similar audiences, so you can take your purchase list, all those that are, all converters and then just like in Facebook you get the look alike audience, you can do a similar audience with Google. And so that’s a pretty good audience to test. Steve: What does the landing page look like, just curious for those ads? Brett: Well, if you do shoppable TrueView, your landing page is probably your detail page because that’s the way that item, that’s how that platform works. Steve: But for top of funnel, like, they won’t have visited your site yet right? So are you just showing them random products then or related products to the video? Brett: Yeah, so usually you try to relate the products to the video. So it depends, like if you are going top of the funnel and you more want to get them into like a sequence, a presale sequence where you just get them plugged in, then it’s probably not going to be shoppable TrueView. It’s just going to be TrueView with click through to the site, and then your page is informational. You want to definitely try to grab their contact info in some way. I love how you guys are doing the spinning wheel on your site. Some of the clients same end working pretty well, but yeah, it’s top of the funnel purely then, then maybe you don’t do shoppable TrueView. But we are still testing shoppable TrueView even with top of the funnel because we are looking at a similar audience. Sometimes we will refine that a little bit more. What seems to be the most promising audience right now is looking at a combination of in market audiences and keyword targeting. So if you look at in marketing audiences, those are people that identify themselves through their behavior or something else for this that I’m in the market for skin care, or I’m in the market for an automobile, I’m in the market for hair care, something like that. So you get this audience you can pick in and YouTubers saying, okay, these people have indicated they are in the market for this product, and then want to layer in keyword targeting. So now I’m saying, okay and this person has recently searched for organic skin care where they recently searched for barbecue recipes or best pallet grill or something like that. So now you are saying, okay I’ve got this audience that they have identified they want to buy something and they are searching on YouTube for keywords that also cause them to be more qualified. So that audience seems to be the most promising and the most exciting. But it’s still, we are still testing a lot of things and I would not start with top of the funnel. Steve: That’s interesting; I didn’t know you could do that. So you can target people based on what they’ve searched in the past recently? Brett: Yeah, yeah, what they’ve searched for on YouTube, so you do your keyword targeting. Steve: On YouTube, okay, okay got it, got it. Steve: Uh okay interesting, so I cut you off, yeah. Brett: Yeah, so that’s what I’m most excited about, so I mean so then what I would look at let’s say we are promoting pallet grills which we’ve done this a lot with their huge portion on holidays. So I’ve got my pallet grill video, in that case, I’m going to go ahead and put the pallet grill PLA. So I’m going to make that shoppable TrueView because why not, I want to show the price, I want to maybe get some people clicking and shopping. So I’ll run the pellet grill video. I have the pellet grill PLAs right there with, it’s going to be Shoppable TrueView, and then I’ll go after that audience, so if in market plus keywords. But again, it’s going to be nowhere near what your remarking list is and in some cases you’ll get nothing in terms of [inaudible] [00:46:07]. Steve: Okay, I mean this sounds like a lot like Facebook top of funnel also right, I mean like whenever I run top of funnel Facebook, I’m just trying to get their email for the most part. Brett: Exactly, trying to get their email, trying to get them on a list so you can remarket them in a slightly different way exactly, yeah. It’s definitely the long play. Like if you are just looking at, okay, I’m running top of funnel to get some direct conversions, good luck. That’s probably not going to happen right away. You need to push them into your funnel. Steve: Okay, okay. I’m just curious like what is like the minimum budget you would recommend to even start running these types of ads like the shoppable TrueView ads? Brett: Yeah, if you are doing remarketing, then I wouldn’t really put that much of a minimum on there, you may as well set it up and start testing. I guess the one variable though is like the effort or the expense to create the video right. So you a want pretty decent size remarketing list. The minimum I think is 1,000 people on the list as your absolute minimum, but if that’s all you have you are going to be pretty limited in your visibility there. But I would look at, do I have 1,000 people on my marketing list or hopefully more. And then really whatever budget you want to put out there, a lot of times we are looking at $500 so a month budget for shoppable TrueView just because we kind of calculating, okay that’s going got get us X number of views, and will that give us any meaningful data? But if you are going after remarketing list, as long as you’ve got enough people to target then go for it. If you are a smaller store with smaller amounts of traffic, and you are only doing remarketing, then likely whatever budget you have you are not going to quite hit. Steve: I guess what I’m trying to ask is like how do I know, like in Facebook like there is this, there is frequency right, and so how do I know whether I’m saturating these people, is it just adjustment based on like the return on ad spend when it comes to ranking these ads? Brett: I mean that is definitely the most important metric in my opinion is to look at the return on ad spend and CPA. But we do often look at frequency capping when we are setting up these campaigns, we just kind of did that for one of our retail clients recently. And it depends, I mean it all goes back to testing in my opinion, but maybe three views within a week or something like that and that’s going to be your cap on frequency. But just kind of look, dig into the numbers. But to me it’s like would it be a worthy effort in starting; probably need to have a remarketing list of minimum 1,000 to 5,000 and hopefully more before we kind of dig in you know. Steve: Okay, okay yeah, I mean of course you have to look at your numbers. I was just looking for like some general guidelines since you run this for so many different companies. Brett: Yeah I got you; it’s all over the board on some of that, so I’m having a hard time getting an exact number there. Steve: Okay and I know you specialize in shopping. I’ve actually, we spend a lot of time talking about TrueView, but I was wondering if you had some — like when someone comes to you with their shopping campaign and let’s say it’s not performing well, what are just, like the first three things that you might do to try to see what they are doing wrong or how to fix one of their Google Shopping campaign? Brett: Yeah, yeah it’s a great question and actually it’s very related because when you start working on your feed as an example to optimize your feed that’s going help with shoppable TrueView as well, because shoppable TrueView uses the same feed, the same product feed you use for Google Shopping and it’s used for shoppable TrueView. But usually the first three things we look at, the first is going to be the feed, we want to look at the actual product. So how optimized is your title, description, product type, you got the correct Google product category. A lot of times we see miss matches there which can throw Google off just a little bit and kind of to go back to the SEO days you know back — it’s kind of where I got my start was optimizing titles and descriptions and things like that. So we look at that first, and it’s very common to either find clients that have lots of products that are disapproved, or very weak tittles that are not very descriptive without keywords in the title. So look at the feed first and then you want to look at the structure of the campaign itself. So I’m a big believer in even looking at full funnel for Shopping. And Shopping by nature is kind of lower in the funnel anyway, so I mean there is not a true top of funnel for Google Shopping, but relatively speaking there is. So like if some just typing in, going back to the barbeque example, I’m kind of stuck on that I guess. But if I just type in just pallet grill, I’m probably higher in the funnel on the search there because I don’t know brand, I don’t know details, I’m just pallet grills is what I’m typing it. Brett: But I have someone to target that person most likely, so we like to have kind of a top middle and bottom of funnel campaign in Shopping. Now as you know and I don’t want to get into all the details because I know you got another episode all about Google Shopping. You don’t pick your keywords; you influence keywords with your feed and with your negatives and with your bids and things. So we typically just try to pull out top products, push those into the top of the funnel campaign. So what are our top converters? That’s what we are going to bid higher on, we are going to structure that campaign where someone who is typing in that really broad general term, that’s the product you want to lead with. Then we look at — we like skew level biding, so kind of on the middle of funnel, bottom of the funnel where we at least want to look at skew level performance. And this is another one of first things we look at is, okay if it’s underperforming, there is probably some winners and some losers in there. What are the products that are doing well, what are the products that are not doing well? And we like to separate those out on separate bids. There is some disagreements on that, I think at a minimum you have to look at reporting at the skew level, but I like to bid at the skew level as well. Brett: And so what we’ll look at is okay this product is really underperforming, then why is it underperforming because we are at price competitive, is it an image issue, is it something else? And so we will try to trouble shoot that product so that basically you are trying to prune the campaign and feed the winners and starve the looser. But then also one of the things that’s just fascinating, we try to run a bottom of funnel campaign that is super low bid, put everything in it and occasionally those do really well. But we like to look at yeah feed and then structure and then bid, and then those are typically the areas where you win. Steve: I notice in my feed there is always like a handful of products that just don’t get any impressions, but in terms of what the merchant center is telling me everything is set up properly, is there a reason for that do you think? Brett: It could be a number of things; I mean it could be that just there is not much search volume for that product. It could be that your title that you don’t have enough detail in the title description product type for Google to say, ahh, this is exactly what this is. It could be, so if you haven’t double checked that everything is approved, then one of the other things we’ve seen is that sometimes people think it’s okay, but it’s actually listed as out of stock when it’s actually in stock. Brett: But typically like one of the things we do is we’ll take things with zero impressions and make sure that they are actually eligible to be served, and then we’ll bid up on it. It could just be that you are not competitive; there are some, some areas where even the competition is really fierce for that particular product and those particular keywords. So you need to push the bid a little bit more. Brett: So that’s another place to look. Steve: Okay, hey Brian, we’ve been chatting for 50 minutes. Brett: Yeah, yeah, all right. Steve: I know, yeah I can’t believe it actually. I do want to be respectful of your time. Really learned a lot about shoppable TrueView today because I’m not using it and it’s only been up for about a year or so, has it been a year? Brett: Yeah, I think it’s been about a year, so it’s new for us to. I mean we knew Shopping forever but yeah, it’s still newer and not a lot of people are using it, at least I don’t encounter that much so I’ll talk to a lot of people using it. But I think it’s pretty exciting and I think it’s getting continued to improve, and I think it could be a good little addition for most commerce stores. Steve: Yeah, absolutely, I mean the conversion rates for someone who comes to your site is what? The average conversion rate is like 2%, right? So the more ability of view to bring people back like the more sales you’ll make, right? Steve: Brett, where can people find you online if they need help with their shopping campaigns? Brett: Yeah, absolutely so check us out at omgcommerce.com, I’m also on twitter occasionally @BrettCurry, get me on LinkedIn or Facebook whatever you prefer, but at omgcommerce.com is probably the best. Steve: Cool. We’ll Brett thanks a lot for coming on the show man, I learned a lot. Brett: Yeah, really enjoyed it, thanks Steve, we’ll have to do it again. Steve: All right, it sounds good, take care. Brett: All right, you too thanks. Steve: Hope you enjoyed that episode. Brett is an expert when it comes to Google advertising, and we are actually working on a joint case study right now where he has taken over a couple of my Google ads and I will report on the results. This post will come out in the next few months, so stay tuned. For more information about this episode, go to MyWifeQuitHerjob.com/episode173. And once again I want to thank Seller Labs. Their tool Scope has completely changed the way I choose keywords for both my Amazon listings and my Amazon advertising campaigns. And instead of making random guesses, Scope tells me exactly which keywords are generating sales, and within the first week of use I actually saw a 39% increase in sales. It is a no brainer. So head on over to Sellerlabs.com/wife and receive $50 off. Once again that’s sellerlabs.com/wife. Now I talk about how I use all these tools on my blogs, and if you’re interested in starting your own ecommerce store, head on over to mywifequitherjob.com and sign up for my free six day mini course. Just type in your email and I’ll send you the course right away, thanks for listening.